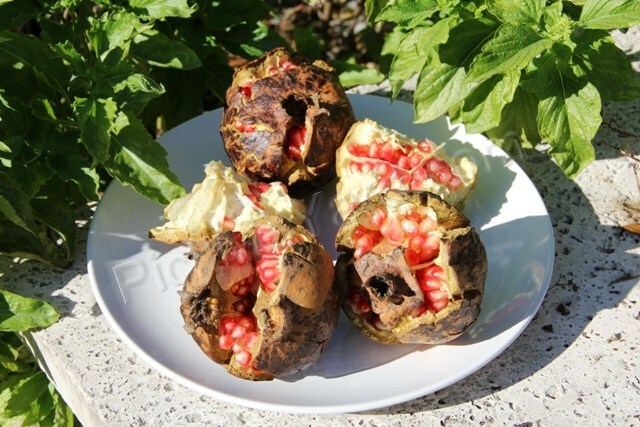 This entry was posted on November 19, 2012 at 5:07 pm and is filed under Fruits of our labor with tags are pomegranate seeds good for you?, can I eat pomegranate seeds, growing pomegranates in Florida, how to cut a pomegranate, pomegranate seeds, pomegrante seed recipe. You can follow any responses to this entry through the RSS 2.0 feed. You can leave a response, or trackback from your own site. Save me some 🙂 I am one of those that have never tasted them! Seeing your bizarre looking fruit is encouraging. I know they’re not a species generally recommended for Florida, thanks to our humidity, but I know that many have been grown successfully here. Mine are still young, but I’m hopeful. As for the “neglected” tree, I’ve found that keeping grass away from the tree (basically, hoeing a ring out to the drip line) and mulching it makes a big difference in growth and tree happiness. During my Master Gardener training, we saw some UF root system excavations showing how many of the feeder roots are in the top 6″ of soil, right where the grass is. Eliminate the grass and yields/growth goes way up. I don’t have time to take care of the tree in the photo properly, but if I did, removing the grass would be the first thing I’d do. I took very good care of my pomegranate trees in the first couple of years after planting them and I experienced a lot of fruit drop. When I stopped worrying about the trees, I started getting fruit. 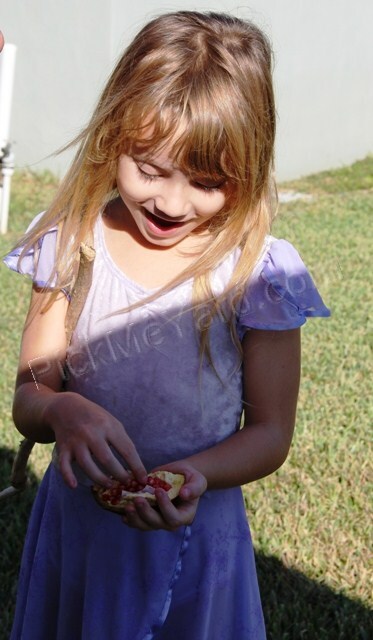 I have a ton of fruit trees, vegetable and flower gardens. I don’t have much help so sometimes I have to let the weeds and grass grow. Our dairy goats are priority on our “to do” list these days. I try to let people know that you can have fruit trees and gardens without trying to make it perfect. A farmer would try to increase the yield and make the fruit pretty to sell it. A mom with a job, kids, animals and a big yard full of edibles is content to to have fresh and delicious fruit from a neglected tree. I’ve looked into the master gardener program several times but I don’t have time to be a permanent volunteer for the program as is required by them. I’m self-taught and quite proud of it. Good for you. Me too, for the most part. I jumped into the MG program this last year to get as much info about my specific region as possible. It was also a good way to meet other gardeners and trade cuttings. 😉 I’m all about free plants. And don’t think I’m judging you because of your grass-encircled tree. We used to have dairy goats and they totally ate up our time… I got rid of them because I realized I was more of a gardener than a goatherd. Really miss the milk, though. It’s hard to do everything. I’ve put out trees (from cuttings) in numbers on purpose just to see what thrives and what doesn’t. Less work and free food is always a plus. Yes, it is tough to do everything. We’ve got our priority list these days. I never give up on the gardening but sometimes it takes a backseat for a short time. I did feel a little judged about my tree with the grass up next to the base… funny, because I really thought twice about using that pic. Thanks for clarifying 🙂 It’s my reality though. I have a lot of maintenance. By the way, I love your blog, http://www.floridasurvivalgardening.com/. I subscribed. 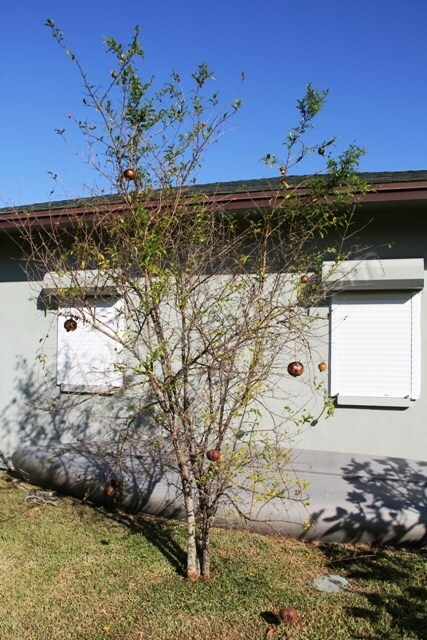 I really got smacked-down on the grass around my trees a couple of years ago… I became a grass-free evangelist after my aunt’s peaches grew twice as fast as mine. I couldn’t figure out what was going on until I saw a paper from Minnesota and simultaneously saw the excavation shots in my MG class. Of course, peaches are really maintenance hogs. 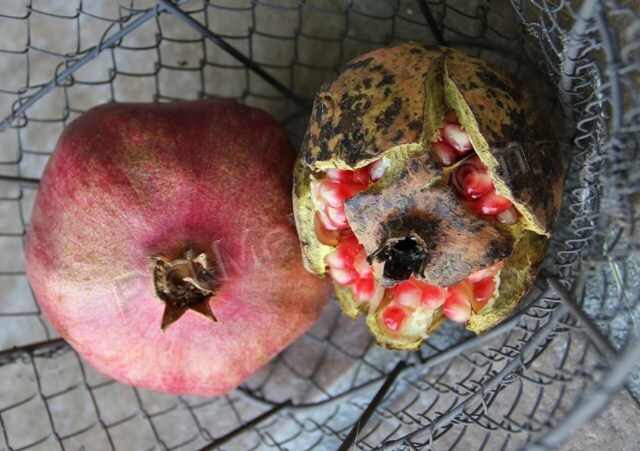 From what I’ve heard, pomegranates don’t do that well with typical fruit tree care, so your observations stand up. And really – most of our best gardening knowledge comes from paying attention. Some things thrive with a bit of stress. I always enjoy your posts, BTW. Been reading you for a while now. I only have experience growing one variety in Florida. I read that Punica granatum ‘sweet’ is the sweetest variety. If I had one of these, I personally would try growing it. Actually, I think I will go seek one out!